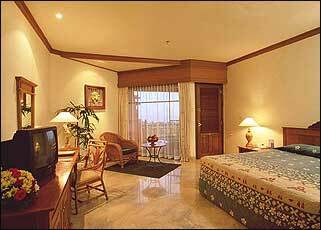 Welcome to Melia Benoa Bali in Nusa Dua. Bali, morning of the world, where everyday brings forth a pageantry of color, vibrant sounds and memorable sights. Enter into this world at Melia Benoa, an intimate and elegant "All Inclusive" seaside retreat located in Tanjung Benoa, Bali's value resort area in Nusa Dua. Set directly on the beach overlooking the Indian Ocean and in the midst of lush tropical gardens, The Melia Benoa is only a short drive from the Ngurah Rai International Airport. Nearby is Nusa Dua, Bali's most exclusive resort area with a shopping center and Bali Golf & Country Club, an 18 hole championship golf course. Melia Benoa's Balinese inspired architecture reflects the graceful nature of Bali. Melia Benoa's 90 spacious rooms and 38 suites combine a subtle Balinese touch with modern conveniences. All rooms are air-conditioned and equipped with IDD telephone, satellite TV, minibar, refrigerator, safe deposit box, and hair dryer. Every tastefully furnished room features a private balcony with sweeping views of the majestic Indian Ocean or our lush tropical gardens. Whether you prefer to indulge in the spicy flavours of Asia or more traditional Western favorites, the chefs at the Melia Benoa expertly perpare tantalizing cuisine for every occasion. An open air seafood restaurant, coffee shop, Italian restaurant, pool side BBQ and 24 hours room service are ready to satisfy the most discerning palettes. MELIA BENOA IN EXECUTIVE "GOLD PACKAGE"